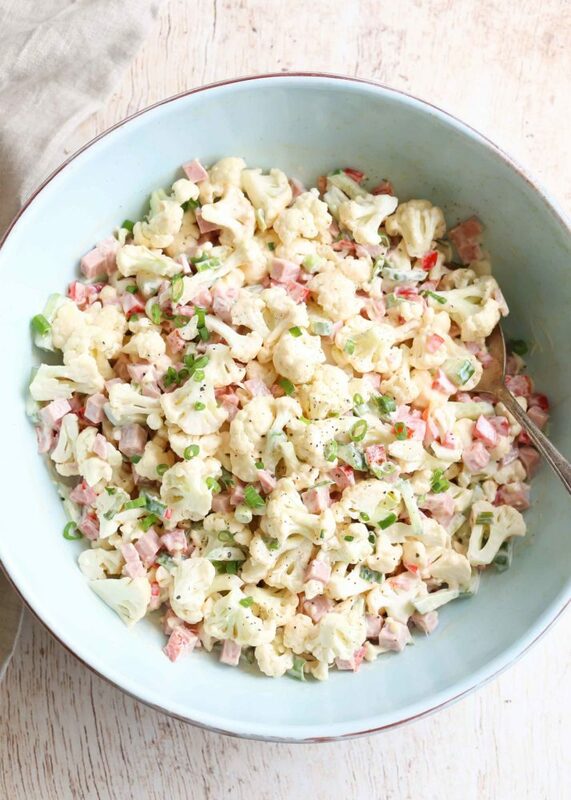 This Cauliflower Salad Recipe is so easy to make. You’re going to love the crunchy and crisp cauliflower florets with bologna, red peppers and cucumbers. Great salad to take to potlucks! Enjoy this salad with Chicken Thighs & Potatoes Casserole or The Easy Potato Meat Casserole and a fresh loaf of Bread. Cauliflower is such a unique vegetable and our family loves it. We always have cauliflower in the refrigerator. I love to experiment and make different salads and add cauliflower to them. I had some fresh doktorskaya kolbasa (bologna) and cauliflower I decided to throw together a simple salad. 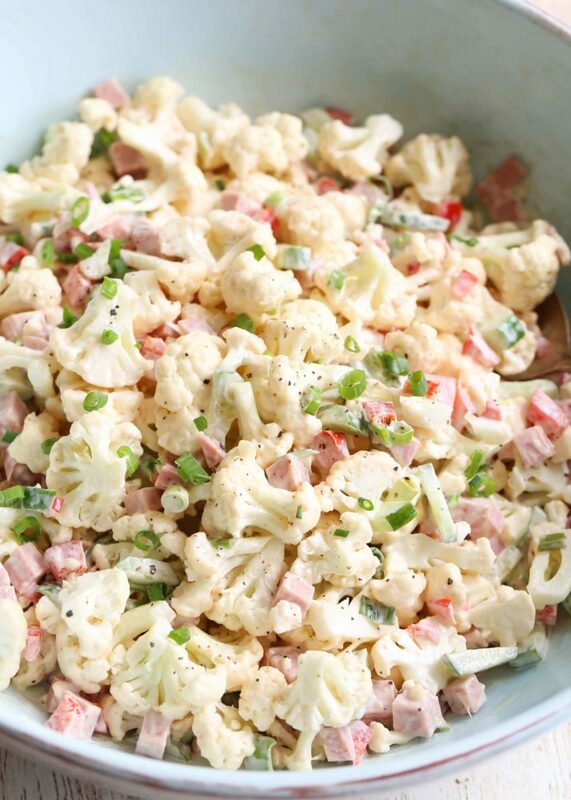 This cauliflower salad recipe is what was created, it turned out amazing. The combinations just flow together and taste so yummy!! I love how the cucumbers and red peppers complement the cauliflower florets with the meat. Tip: Be sure to cut the cauliflower florets into small even pieces. The salad tastes better when all of the pieces are the same in size. What kind of meat can I add? In this salad, there are two main ingredients, the cauliflower and bologna (doktorskaya kolbasa for the Slavics). We love going to the Ukrainian store every once in a while and get some meats from the deli, we don’t have one nearby so we don’t go as often. They have an amazing doktorskaya kolbasa (a smoked bologna). It’s one of my favorite meats, I use it in Olivier Salad along with this salad. Since I don’t always have that meat on hand, I substitute for regular bologna or ham and it works just fine. When ordering at the deli, ask them to slice the pieces thick so they are cubed. Did you know that cauliflower has many health benefits?! It boosts your heart health, improves blood pressure and kidney function. It’s rich in vitamins and minerals. Eating it on a regular basis helps you get the important nutrients into your body. Is this salad Keto diet approved? This salad is great if you are on the Keto diet! All of the vegetables, plus the meat and mayo make it a wonderful salad for those on the Keto diet. Can I make this vegetable salad ahead of time? This is a great salad to make for a gathering or potluck and prepare it in advance (up to one day in advance). Just make everything per instruction but don’t mix it. Then, mix right before serving. I love that this salad also contains raw cauliflower, cucumbers, red pepper, and red onion. This vegetable salad is filled with a variety of different flavors but they taste wonderful together. It’s one of those salads that doesn’t get soggy quickly so it’s great to bring to make when you won’t be eating right away. 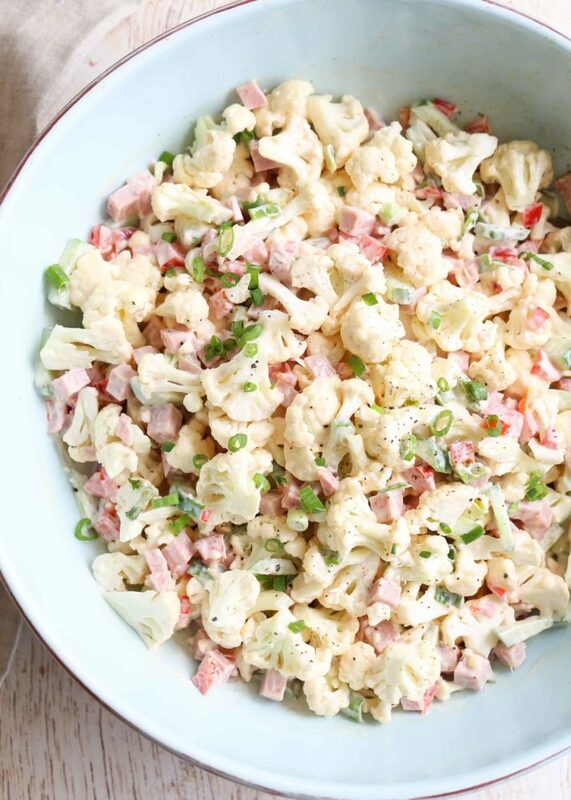 This Cauliflower Salad Recipe is the perfect salad for potlucks. It's easy to make and the cauliflower, meat, cucumbers and red peppers with a mayo dressing work so well together. Keto diet approved. Cut your cauliflower into small even-sized florets. Thinly chop the green onion. Add mayo, salt and pepper to taste. Mix well. Serve. I want to ask u about cauliflower it should be boiled? Hi Anna, no boiling, chop it raw☺. Enjoy..
Made this salad and loved it! Great alternative to olivye. Spasibochni. I agree with you, and so much quicker then olivye.. :o)..